If you enjoy writing, you may have entertained the thought of becoming a copywriter. Copywriters spend their days writing prose for the purpose of advertising to promote and sell goods and services. For example, a copywriter might write a new jingle for a cereal commercial, or come up with a new company slogan. At advertising agencies, a copywriter is known as a “creative” because she makes up the slogans or copy that drive ad campaigns. Bud Light's "This Bud’s for You," BMW's "The Ultimate Driving Machine," and Nike's "Just Do It" are examples of famous ad phrases that are the work of a copywriter somewhere. Write social media content: Copywriters ust produce content that shows or reflects the client's brand or voice. Collaborate: Copywriters work with many people from PR, marketing, and customer service. Produce error-free content: Content must be high-quality and in adherence with the company's style guidance. Interpret creative direction: Adapt the points from a creative brief into persuasive copy. Manage multiple projects: Juggle multiple projects, typically with short deadlines. Propose concepts for copy: Present along with the underlying strategy to the company's leadership. A copywriter's salary varies based on the area of expertise, level of experience, type of clients, and other factors. Landing a full-time job as a copywriter typically requires a four-year bachelor's degree. No licenses or certifications are required, but it helps to gather experience and previous work samples. College degree: Although you might be able to land work by creating spec ads, hiring managers prefer to see work you’ve done while interning at an agency. Also, while you don’t need a graduate degree to become a copywriter, hiring managers do prefer to see that you’ve earned an undergraduate degree in English, communications, or journalism. Portfolio: Getting a job as a copywriter is tougher than getting a job in other fields of advertising because you need a portfolio of work, known as a book in the ad world, to get in the door. To get a book together, your best bet is to start with an internship. You can start early by writing for your high school or college newspaper. Your book is a collection of ads you’ve worked on, and you can’t work on any ads until you get some work at an advertising agency. Internship: To get an internship at an ad agency you need to be diligent in searching online for openings. You also can contact creative directors who run the creative departments at ad agencies. Creativity: Copywriting is all about creativity, so you really need to have a talent for the work. Social media: A successful candidate will have a solid grasp of SEO concepts, and exceptional skill and understanding of the nuances of social media writing. 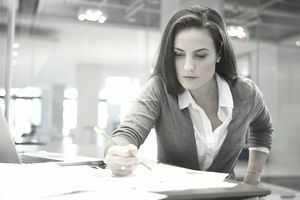 Ability to learn on the job: While some people might learn on the job, this kind of work is best for people who can craft stories with images and words and think outside of the box. It’s stories that often sell products, and the slogans and images simply tell the stories. Getting an internship in the creative department of an agency also is a good way to figure out whether you have the talent to be a copywriter. Communication: A copywriter must be able to communicate well with clients and coworkers. Attention to detail: Client satisfaction is all about the details. Writing jobs are projected to grow slightly faster than average, at 8 percent over the next 10 years. This holds true for all writing jobs rather than just copywriting. Copywriters work in an office if they're an employee, or from home or anywhere else that has computer access, if they're self-employed. Almost 65 percent of writers work on a freelance basis, and set their own hours. About 25 percent of writers work part-time hours. Copywriters may need to work long hours or put in late nights if they have a deadline for a project. Save clips of your best work and arrange them neatly in a physical or online portfolio that you can easily share with prospective employers. If you're in the process of job-hunting and looking for another avenue, you can create spec ads on your own. Because copywriters work in various fields—print, TV, radio, and online—your spec work will have to mimic the kinds of ads you’re interested in creating. If you want to work online, you should be creating banner ads and online campaigns.